The most extreme metro Detroit weather types- high winds and lightning can often be the most damaging to a property, especially when either causes downed trees. 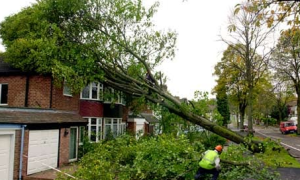 Realistically, falling tree limbs and fallen trees cause millions of dollars in damage to homes, cars and power lines each year. And while neither lightning bolts nor tornado-like winds are preventable, small steps can be taken to limit their damage to your rental property and the repair cost to you. •Examine nearby trees for decay and remove any damaged limbs. Check with the city for information regarding removal requirements or city services. •Limit pruning to maintain a stable tree. Over pruning can weaken the overall structure of the tree and create loose limbs. •If planting new trees, look for types with deeper, non-invasive roots. •Invest in an insurance policy for lightning and wind damage. Most standard homeowners insurance covers lightning damage, so understand the terms of a policy. •Consider hiring a trusted property management company that offers reliable contractors and has daily contact with city departments.